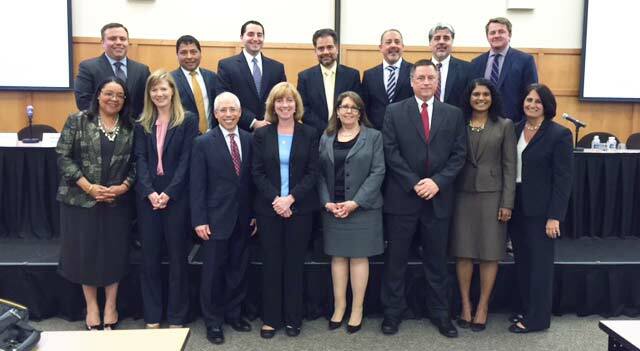 NJSBA, along with the New Jersey Association of School Attorneys, held its Spring School Law Forum on June 8. The presenters at the conference, which attracted about 150 attendees, gathered for a group photograph. Pictured from left to right, back row: Joseph Castellucci, of Schwartz Simon Edelstein & Celso; Bernard Mercado, of the Newark Public Schools; Joseph Roselle, of Schenck, Price, Smith & King; Arsen Zartarian of the Newark Public Schools; William Donio, of Cooper Levenson; John Croot, of Adams, Gutierrez & Lattiboudere; and Chris Barrett of Cooper Levenson. Pictured left to right, front row: Hope Blackburn, Jersey City Board of Education, and president of the N.J. Association of School Attorneys; Jennifer Roselle, of Genova Burns; Richard Bauch of Bauch, Zucker, Hatfield; Elizabeth Murphy, of Bauch, Zucker, Hatfield; Derlys Gutierrez, of Adams, Gutierrez & Lattiboudere; Michael Kaelber, of the New Jersey School Boards Association; Sanmathi Dev, of Capehart, Scatchard; and Paula Clark, district coordinator of compliance, grant administration; special projects and HIB coordinator at Wayne Township Public Schools.